At first glance, this bat is very similar to the Funnel-Eared Bat. It is small, the head and body are together 3 to 5 cm (1-2 inches). It weighs 4 to 7 g (0.14-0.3 ounces), and it has a big tail membrane, and that is on purpose. They use it as a dip net to catch insects. 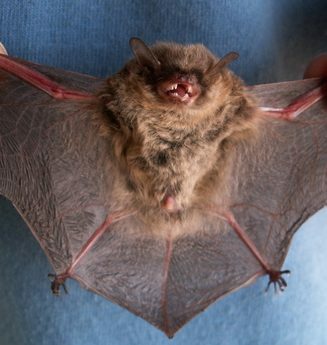 These bats fly with fast wing beats and many dives and turns to catch their prey. Myotis bats can be found in caves, tree cavities, rock crevices and in buildings. They normally rest in groups. The bat family to which Myotis belongs is a big one. It comprises three genera and 97 species, with a wide distribution over the world. Our species, M. nesopolus, can be found in Venezuela and the islands nearby.